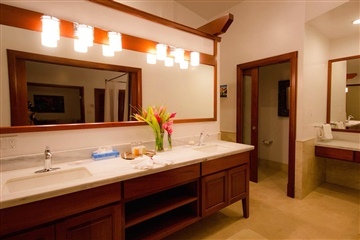 Experience Belizean luxury in our new Master Suite. One of the largest suites at the Hotel, this room combines stunning views with luxury and space. The Master Suite has a main living space with wet bar, sitting area, and a Queen pull out couch. 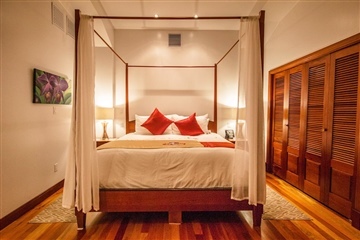 The Master Bedroom contains a King sized canopy bed, a sitting area with large sliding glass doors that lead out to a spacious balcony that overlooks the pool area. 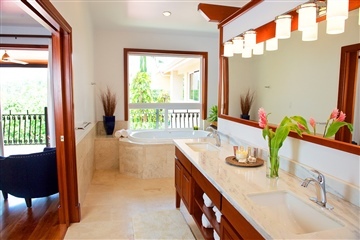 This suite features the most luxurious and largest bathroom on-site, with marble finishing, vanity mirror, double sink, double shower and a private soaker Jacuzzi bathtub. 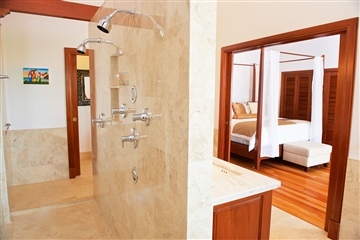 Guests staying in the Master Suite enjoy complimentary breakfast daily and access to on-site hotel tours. 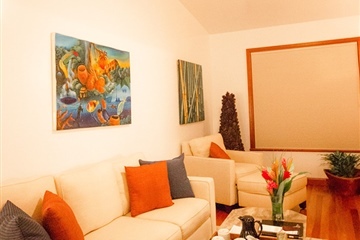 We spent 5 days in the master suite in late July 2014 at San Ignacio Resort Hotel and loved every moment of it!! With the Mayan package plus a canoe trip for half a day we really enjoyed ourselves. Lots of fun! The staff is exceptional to say the least!